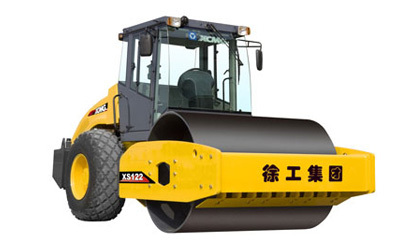 XS142J/XS162J/XS182J vibratory compactor is a kind of heavy duty self-propelled vibratory compactor. It can effectively compact various soil layers and rock fill, and can be applied to the constructions of modern freeways, airports, embankment fill, ports, dams, railways, mines, etc. The spacious and bright cab features wide view and comfort. The humanity instrument panel has a reasonable layout, all the control buttons are clear at a glance. Adopt the gearbox with synchronizer, which is easy to operate. The standard configuration includes imported open gear pump and motor. The optional configuration includes closed hydraulic vibration system, imported piston pump, motor (16t, 18t). All those have a long service life, supplying stable start-oscillation and oscillation stop and high compacting quality. Shanghai Diesel Engine 114 series water-cooled engine has low noise, meeting the emission standard of European I. The maintenance-free battery can be started easily and work smoothly in low temperature. Unique drum structure features good rigidity and intensity. The bearing adopts short cylindrical bearing, featuring high rotary speed limit and strong bearing capacity. The left vibration chamber and right vibration chamber are symmetrical, avoiding the polarization of the drum. The integral convex block drum, split convex block drum, and the cab with air conditioning. The engine cover is easy to open, and the opening angle is large, which make the maintenance part accessible.